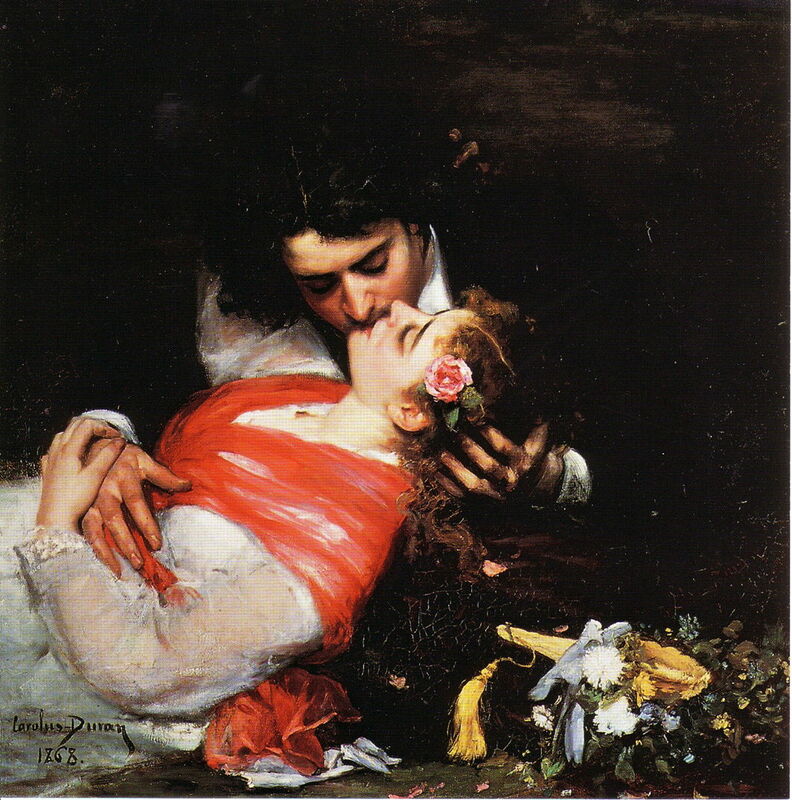 Carolus-Duran (1837–1917), The Kiss (1868), oil on canvas, dimensions not known, Palais des Beaux-Arts de Lille, Lille, France. Wikimedia Commons. John Singer Sargent was a precocious and gifted painter, but those talents were realised with the teaching of Carolus-Duran, whose art is almost unknown. 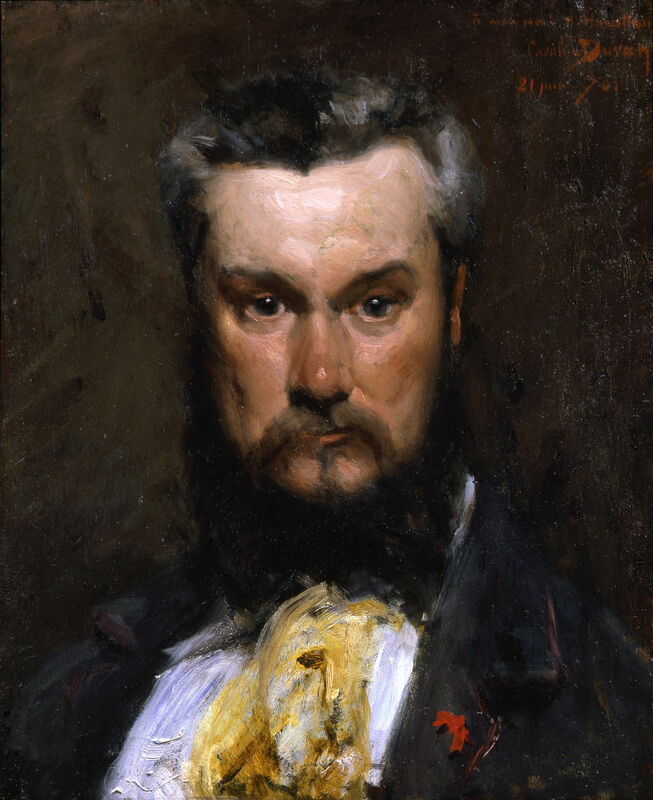 Charles Auguste Émile Durand, who called himself Carolus-Duran, died a century ago. This article and the next look at his career and a small selection of his paintings, in commemoration of that anniversary. Carolus-Duran was born in Lille, in the extreme north-east of France on the border with Belgium, in 1837. He was initially taught by a local sculptor, before being taught to paint by François Souchon, who had been a pupil of Jacques Louis David. He moved to Paris in 1853, where he copied in the Louvre, assumed the name Carolus-Duran, and started to make friends with other artists including Henri Fantin-Latour. In 1858, he was introduced to Whistler. Carolus-Duran (1837–1917), The Sleeping Man (1861), oil, dimensions not known, Palais des Beaux-Arts de Lille, Lille, France. Wikimedia Commons. 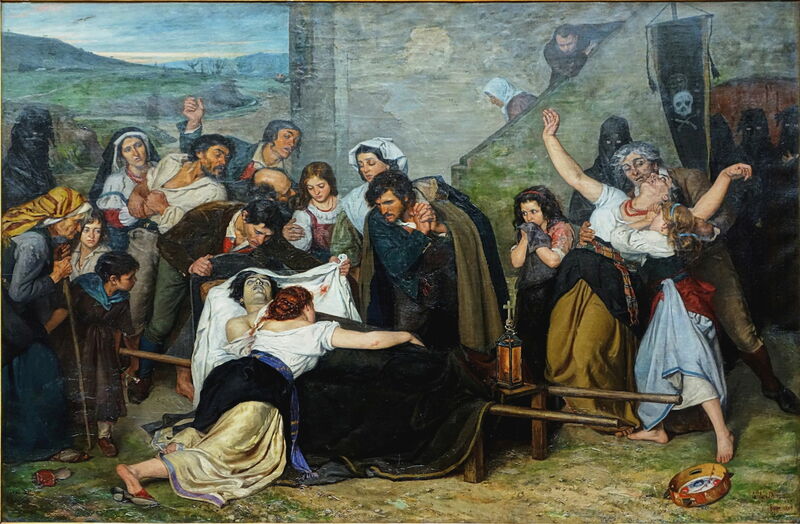 In 1861, he entered a painting entitled Visiting the Convalescent for the Wicar Prize. The latter was a recent institution in memory of the Lille painter Jean-Baptiste Wicar (1762-1834). 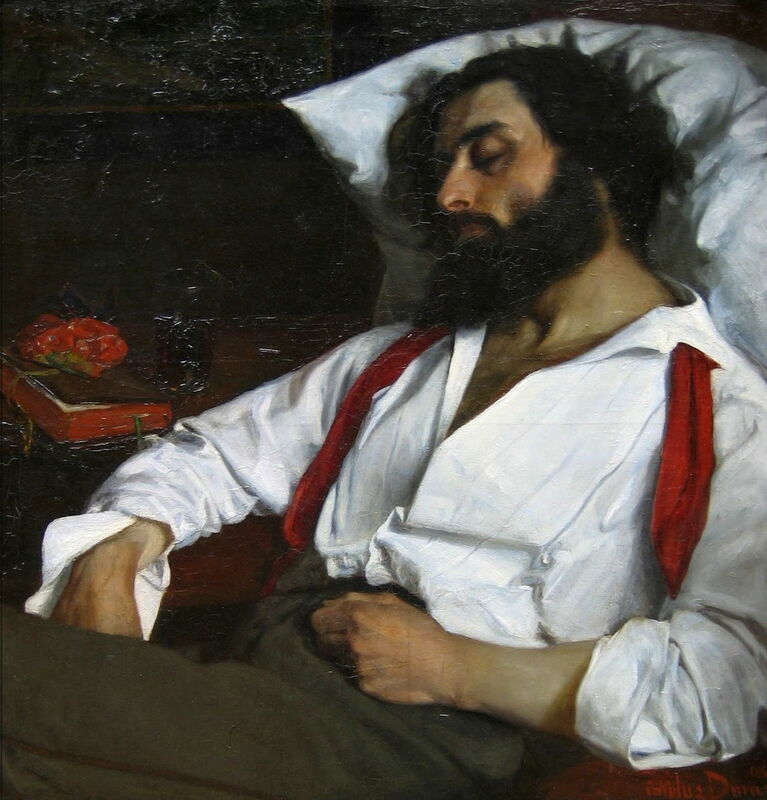 Sadly, Carolus-Duran later cut up his original canvas which won the prize, but kept a fragment which is now in the Musée d’Orsay, and painted this variant, The Sleeping Man (1861), which is in Lille. Both show clear influence of Gustave Courbet’s realism. Although not as prestigious as the Prix de Rome, the prize was sufficiently valuable to enable Carolus-Duran to study in Rome and beyond, which he did in 1862. Carolus-Duran (1837–1917), The Assassinated Man, or Remembrance of the Roman Campaign (1865), oil, dimensions not known, Palais des Beaux-Arts de Lille, Lille, France. Wikimedia Commons. For much of the nineteenth century, there were French troops occupying or stationed in Rome; until the Franco-Prussian War started in 1870, they were mainly there to ‘protect’ the Papal States, and when Italy became independent in 1861, its capital remained in Florence. Against this turbulent background, Carolus-Duran painted his disturbing work The Assassinated Man, or Remembrance of the Roman Campaign (1865). In 1866, he moved from Rome to Spain, where he became influenced by Vélazquez. He then returned to Paris, where in 1869 he married Pauline Croizette, a painter in pastels and of miniatures. The Kiss (1868) is a touching double-portrait of Carolus-Duran kissing his fiancée Pauline, and perhaps one of the most touching paintings of any couple. Carolus-Duran (1837–1917), The Beach at Audresselles (1869), oil, dimensions not known, Palais des Beaux-Arts de Lille, Lille, France. Wikimedia Commons. In the year of their marriage, Carolus-Duran visited a small village near Boulogne, on the Channel coast, and painted the beach there. 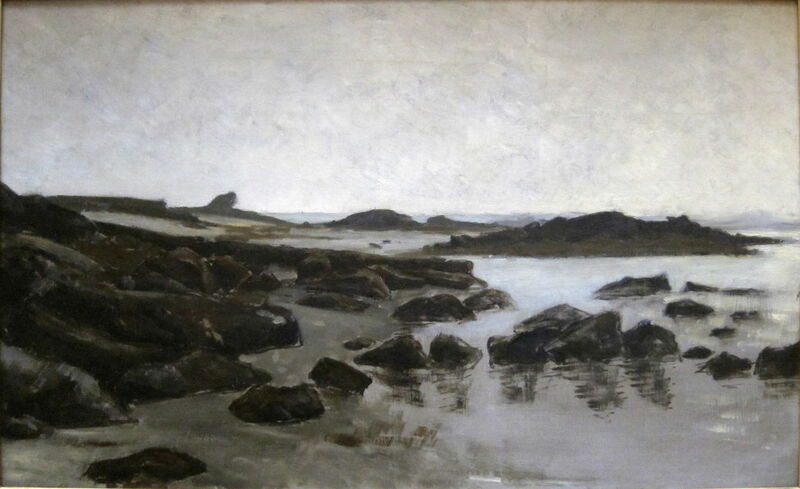 The Beach at Audresselles (1869) (above) and Low Tide at Audresselles (1869) (below) are two of these paintings, in which he may have been experimenting with plein air techniques. He does not appear to have painted any later landscapes. 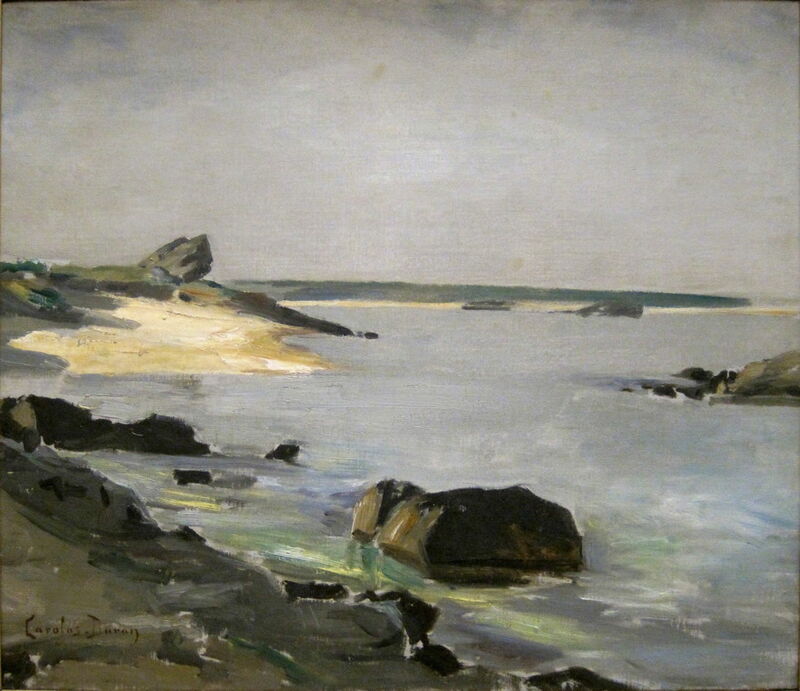 Carolus-Duran (1837–1917), Low Tide at Audresselles (1869), oil, dimensions not known, Palais des Beaux-Arts de Lille (Nord), Lille, France. Wikimedia Commons. Carolus-Duran (1837–1917), Portrait of Hector Hanoteau (1870), oil on panel, 59.7 × 50.8 cm, location not known. Wikimedia Commons. In 1870, Carolus-Duran started to concentrate on painting portraits. His Portrait of Hector Hanoteau (1870) shows this landscape painter, who lived from 1823-1890, and was a friend of Gustave Courbet. Carolus-Duran (1837–1917), Merrymakers (1870), oil, dimensions not known, Detroit Institute of Arts, Detroit, MI. Wikimedia Commons. 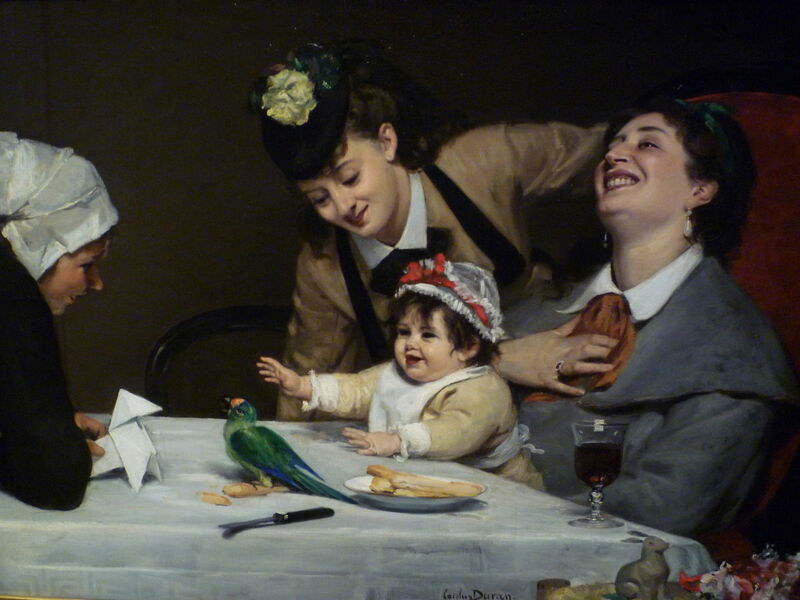 Merrymakers (1870) is a superb and quite intimate family portrait, which I think ranks among his best works. Sadly, the joy seen here was short-lived. That same year, the Franco-Prussian War broke out, and Carolus-Duran remained in Paris, fighting in the same battle in which the young history painter Henri Regnault was killed. Carolus-Duran (1837–1917), Henri Regnault Dead on the Battlefield (1871), oil, dimensions not known, Palais des beaux-arts de Lille, Lille, France. Wikimedia Commons. 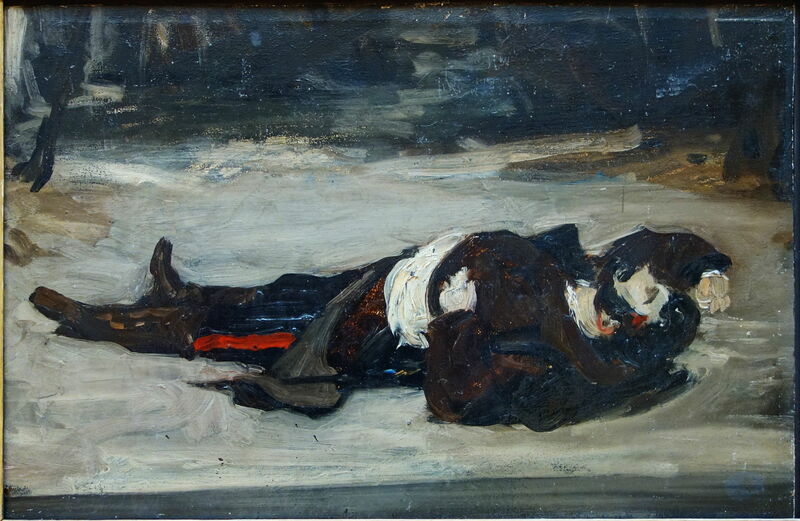 Carolus-Duran’s oil sketch of Henri Regnault Dead on the Battlefield (1871) was painted the following year. After the war, he stayed with his family in Brussels, and in 1872, following their return to Paris, he opened his first proper studio. Among his early pupils there was the young John Singer Sargent. 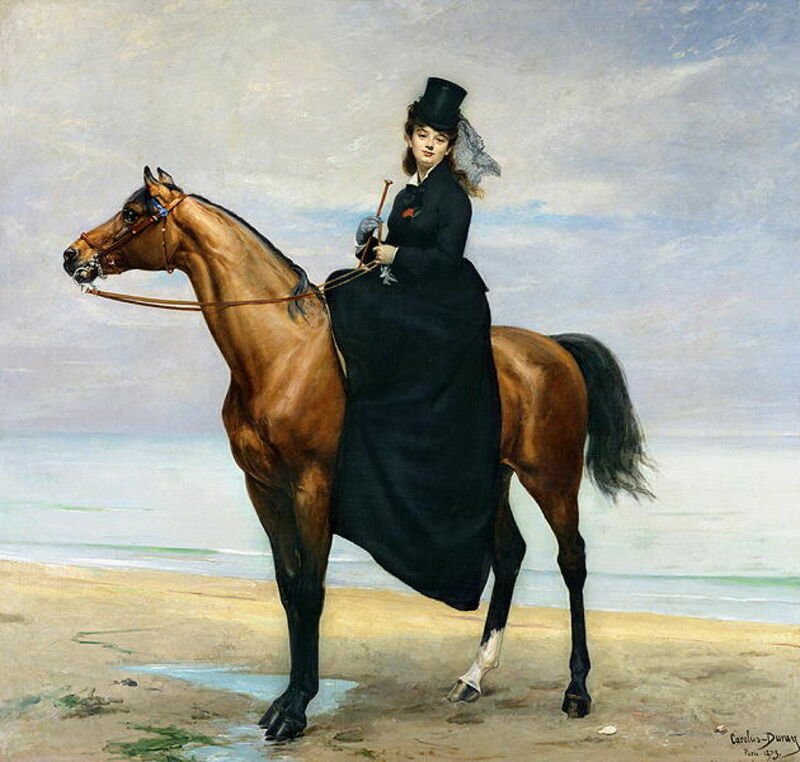 Carolus-Duran (1837–1917), Equestrian portrait of Mademoiselle Croizette (1873), oil on canvas, dimensions not known, MUba Eugène Leroy, Tourcoing, France. Wikimedia Commons. His fine Equestrian portrait of Mademoiselle Croizette in 1873 is an excellent example of his early portraits; bearing the same surname as his wife, I suspect that this is her sister. Carolus-Duran (1837–1917), The Artist’s Daughter, Marie-Anne (1874), oil on canvas, 130.2 × 85.1 cm, Fine Arts Museums of San Francisco, San Francisco, CA. Wikimedia Commons. 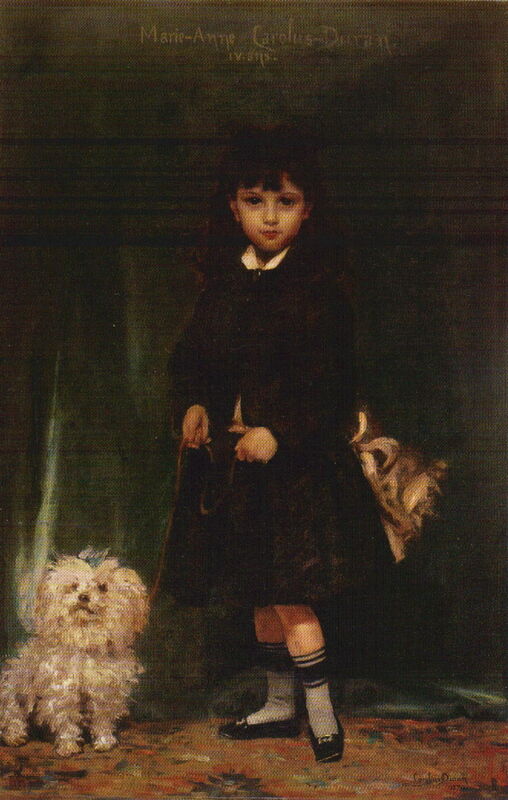 The Artist’s Daughter, Marie-Anne (1874) is a delightful portrait of his daughter and her small dog. I am sorry that the image is of low quality, but it is the only copy which I could find. Marie-Anne married the young playwright Georges Feydeau (1862-1921) in 1889, although they divorced fifteen years later. Posted in General, Painting and tagged Carolus-Duran, painting, portrait, Sargent. Bookmark the permalink. Very nice. I just saw La Dame au gant (The Lady with the Glove), his portrait of his wife at the Rijksmuseum. It was hard to photograph, people were so excited seeing it. I am glad to see some reevaluation of the Academics who painted alongside the Impressionists and post-Impressionists. They also had a painting by his famous student, Sargent, within a stone throw from his master!